Dolly & Kenny, Bowie & Bing, Scooby Doo & The Harlem Globetrotters, some pairings were just meant to happen. Now we have a new and faintly surreal one to add to the list – space rockers Hawkwind and Mike ‘The Wombles’ Batt. Let’s just let that sink in for a moment….ok, processed that? Let’s continue. 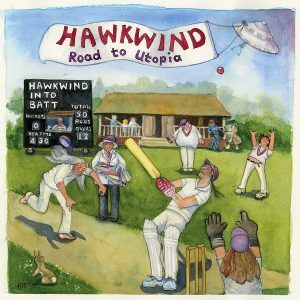 Dave Brock, who was planning a Hawkwind acoustic album, met Mike Batt at the US Embassy in London where they were both applying for VISA’s, got chatting and hey presto, we have ‘Road To Utopia’, the aforementioned acoustic album with added orchestral arrangements courtesy of Batt. Acoustic Hawkwind? How does that work, I hear you ask. Well, rather oddly on opening number ‘Quark, Strangeness and Charm’. It takes a bit of getting used to. They sound more eccentrically British than ever shorn of their electric guitars. There is a solo but it’s way down in the mix and when the Latin horns come in it gets seriously weird and doesn’t really gel. The jury is still out…and very wary. Eric Clapton is then added to the mix for a bluesy take on ‘The Watcher’. Yes, really. It’s nice and loose, Hawkwind jam in the background while Slowhand is given plenty of room to just do his thing. Even on autopilot, Clapton adds a sheen of class. ‘We Took The Wrong Step Years Ago’ gets it right. Brocks voice suits this gentle, autumnal whimsy down to a T. It’s unplugged guitars and Tull-esque flutes bring Nick Drake to mind. There is, however, a lot of filler. ‘Flying Doctor’, never one of Hawkwinds finest moments, goes into twee overload. The Latin horns return and the whole thing seems to exist as a fairly lame peg to hang drug jokes from. “Enough of this gypsy music” cries Brock at one point…. There are several orchestral, ambient instrumental interludes which are tasteful but fairly superfluous. ‘Age Of The Micro Man’ again gets it right, trippy sound effects appear and it leans very close to early Pink Floyd while ‘Down Through The Night’ comes closest to a full on Hawkwind wig out, its ‘Don’t Fear The Reaper’-like riff building in force before a squalling solo takes us into a healthy jam and a big finish. With its village green cricket cover and whimsical nature this album couldn’t be more English – it’s Hawkwind, Batt and Clapton for goodness sake! It’s also somewhat patchy – when it works it works, but when it doesn’t….however, the upcoming orchestral tour, if it plays to the albums strengths, could be very good indeed. PS – there seemed to be no video clips of this new release available so feel free to enjoy a classic bit of ‘Silver Machine’. They should have covered Jethro Tull’s ‘Living In The Past’. Strangely, or perhaps not, I’m much more of a Batt fan than Hawkwind. So this sounds very interesting.